The Sky Sports pundit and ex-Ireland striker isn’t looking for a career change anytime soon. Quinn was speaking in Dublin yesterday for the launch of Sky Sports' Autumn schedule. 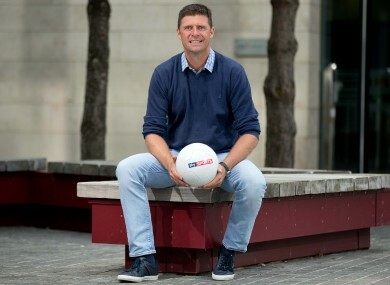 NIALL QUINN INSISTS he is not on a one-man crusade to fix Irish football. Nor is he angling for John Delaney’s job as head of the FAI. The former Ireland striker turned Sky Sports pundit is simply hoping to spark debate so the powers that be can begin to tackle the problems facing the domestic game, the development of our young talent at home and abroad, and Ireland’s international set-up. During an interview on 2FM’s Game On last month, Quinn spoke openly about how he felt the League of Ireland should be tapping into the demand for televised football around the world by selling its broadcasting rights. The suggestion received a mixed reaction from fans but it was refreshing to hear someone with vast amounts of knowledge and experience in the game thinking outside the box. “I was asked my honest opinion on a radio interview about its state,” Quinn said. ”I have great friends, Liam Buckley would be a particularly close friend of mine and I think he would be one of the best football people in Ireland. “Brian Kerr of course is the one everyone points to but there are people like Liam there who more than keep me informed. He is somebody who is so knowledgeable and there are other people. Quinn, who had a spell as Sunderland chairman when the Drumaville Consortium took over in 2006, says he is much more comfortable in the commentary box than the directors’ box these days, but you can’t help but feel he is somewhat wasted in that role. Still a popular figure among supporters, many would be glad to see Quinn take up a position within the FAI and put his theories into practice. No, I wouldn’t because what I can’t do is the politics of being a CEO of a sports organisation. Because that’s political and I think it’s horses for courses. “Politics are unfortunately in it whatever happens. I did some time in the Irish Sports Council and it was very informative, it was the first board I ever sat on and I listened for six months and never opened my mouth. “One of the things that beat me up was that rugby had x amount of people participating, GAA had their hundreds of thousands, but football had as well yet those guys were getting far more money for the development of their sports from the Irish taxpayer and the Sports Council. “I got a little bit wound up about that. I didn’t do much in the Sports Council but I think John Delaney would agree that I had various meetings with him to bring a different view of football in this country and what it’s about. Led by Declan Conroy, the FAI consultation process set up to help plan for the future of the League of Ireland is due to be completed at the end of this month and Quinn is looking forward to reading the findings. “There is a period that all the clubs are being visited where the FAI are awaiting a report on how they might develop the League of Ireland,” he said. “So it will be interesting to see what come out of that. The Dubliner is clearly passionate about the state of football in this country and, like many, has expressed his disappointment at the declining number of Irish players at top Premier League and European clubs. In his eyes, creating a youth system here which also caters for education would be far more beneficial than sending teens over to English clubs only for the vast majority to return disillusioned a couple of years down the line. I’m not on a mission here, I’m not in a position to be on a mission,” he added. “I fully understand the difficulties of being in an organisation like the FAI and trying to keep the whole thing in place, so I’m not saying that. “But I do feel I was right to say there has to be a different focus on what the league is, on what our young players are aspiring to as sadly they are all trying to get away even more now than they did in the past and what are they getting away to? Email “Is Niall Quinn interested in becoming FAI chief? 'I couldn't do the politics'”. Feedback on “Is Niall Quinn interested in becoming FAI chief? 'I couldn't do the politics'”.